This was a delightful episode with a tag-along B (A?) plot involving sparkly metal eating beings. 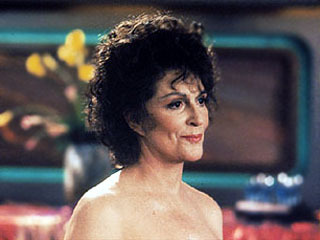 I know that some fans and many of the crew of the Enterprise find Lwaxana Troi annoying but I have always admired her. She is a loud, proud opinionated woman who wears outrageous outfits and pretty much does as she likes. In this episode she is the grandmother who annoys every parent and is especially dear to any grandchild. I want to be her when I grow up. Growing older, especially as a woman, is difficult. You start to become invisible and like Lwaxana start to wonder if you should settle for whatever the world is willing to give you. At the other end of our lives we struggle as children to meet the expectations of our parents and the world around us while still trying to hold onto fun and our sense of ourselves. In the middle are a whole bunch of rules to live by and responsibilities to weigh us down. Lwaxana recognizes the struggle Alexander is going through and whisks him off to have some fun, defying his father and her daughter. At same time Lwaxana is dealing with her own struggle. She is lonely and wants a companion. Her match, through some profiling service is Campio, a man from stuffy, protocol ridden Kostolain. The opposite of Lwaxana. She tries to accommodate, even trying on the fusty wedding gown that has been sent. In the end, she comes to her wedding naked (in true Betazoid fashion) and thereby ruins any chances of a union. Lwaxana protects Alexander by taking him to the holodeck version of Parallax Colony on Shiralea VI, a centre of freethinkers, fun and relaxation. The wind dancers will only let you in if your heart is full of joy. Lawaxana wants to maintain Alexander's sense of fun and adventure, which she thinks is missing from the adults on the ship. In some ways she is right. It must be difficult to provide anything like a carefree childhood on a starship which is in some form of danger every week. It must be particularly difficult for a Klingon. Still, because she is relentless, everyone ends up relaxing in the mud baths, even Mr. Woof. I should say something about the negative side of this approach. While I enjoyed the exploration of the difficulties of ageism, both the young and older versions, and I appreciate Lwaxana's joie de vivre, I was worried that it was all a bit ethnocentric. Some cultures have a different approach to raising children, emphasizing order and discipline. From my perspective, this might seem harsh but do I have the right to interfere? I don't have any answers, I just thought it was important to bring up the question. Lawaxana would say I think too much. In the other, less fun plot-line, the Enterprise is being slowly destroyed by a sparkly, nitrium eating parasite that they inadvertently let loose when they saved Tessen III by blowing up an oncoming asteroid. I found this plot line a thin add-on. It seemed that it wouldn't be enough to have a Lwaxana and Alexander episode so they had to add an alien and some failing life support. Of course, Data saves the ship as everyone else gets sweaty and passes out. Lwaxana knocking on the computer housing and calling the computer dear. Worf bursting the wind dancer bubble. Alexander regaining some of his power by quoting the philosopher — "The higher, the fewer." Gelationous, molecular poo from a sparkly parasite. The edible drinking cups in the mud baths. How do you get up to any mischief as a child when the computer can locate you wherever? Thanks for the lovely review, Doc. All good points. The B plot was sort of pointless. I wish they'd just let the Lwaxana plot take the spotlight. I've always liked her, too. This episode kept reminding me of Auntie Mame, and I'm pretty sure that was deliberate. Lwaxana even called Alexander "My little love." :) One scene in particular jumped out at me, for no particularly good reason: it was Lwaxana talking to the ship's computer. Have they ever done that before? I mean, Majel Barrett's two Next Gen characters talking to each other? I also don't know if I ever shared this, although I probably have. One of Peter David's Next Gen novels established that the computer voice wasn't some random person. It was Number One's voice (the second in command from the Star Trek pilot, "The Cage," also played by Majel Barrett). Peter David said in the book that it was Number One's voice because she was involved in the original programming of the starship computers. I think of that every time I hear Majel Barrett as the computer voice. It's not canon, but it should be. Lwaxana Troi makes a much better grandmother than Worf makes a father. And although she irritates some, I have grown to respect her (especially on DS9, where she had some great episodes). Just like I have empathy for Mrs. Bennet in Pride & Prejudice.